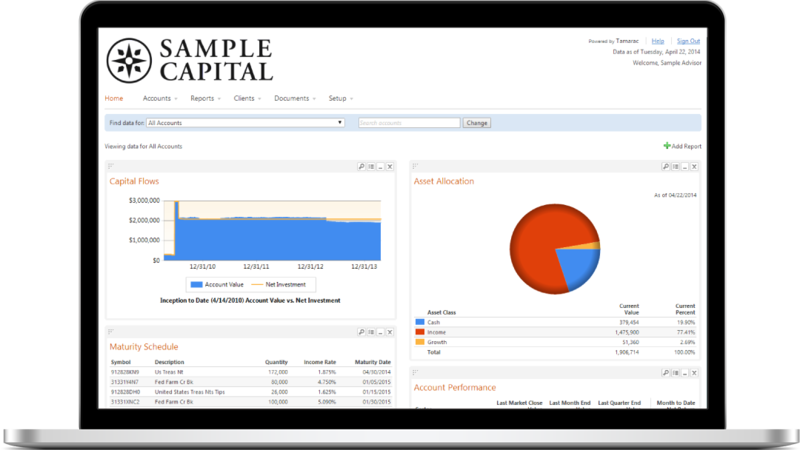 We align investments with each client’s financial plan and handle the reporting, billing, account aggregation, and white-labeled client portals so that you can focus on what matters most. When your client wants to fund future spending needs with income investments, we use our proprietary system to find municipal bonds, corporate bonds, CDs and/or agencies that match their spending needs. Since most clients cannot afford to fund their lifetime spending needs with fixed income, we built growth portfolios that use game theory algorithms that seek to improve a client’s probability of reaching a time-based goal. When your client wants to protect their principal and reduce their exposure to rising interest rates, we look for investment grade income securities that are at advantageous spots along the yield curve and hold them until maturity. Using your client’s projected spending needs and portfolio mix, we can provide historical context to their investments by showing how the portfolio’s underlying asset class performed during every relevant rolling time-horizon going back to 1928. Any account that we manage will enjoy account aggregation, billing, reporting and technology services at no additional charge. Those accounts we do not manage can also enjoy these benefits for a quarterly fee. We understand that the way a portfolio is implemented and maintained can have a significant impact on long-term returns, so we’ve established some best practices. Click on each to learn more. Whenever possible, we seek to reduce the client’s tax liability by using the most tax-efficient versions of the desired funds. We incorporate legacy positions into our model until you and your client are ready to strategically realize the gains or cut emotional ties with a certain security. For each Dimensional fund that we use, we found the most highly correlated, no-transaction fee fund at Schwab, Fidelity and TD Ameritrade. Then we compared the expense ratios, transaction fees, geographic deviations, and asset class deviations to calculate a minimum trade threshold for every security at each custodian. By doing so, we can put smaller contributions to work without the unnecessary transaction fees. If one of the major rating agencies downgrade a fixed income security held in one of your clients’ portfolios, we notify you with a recommendation. When we implement a portfolio, we look to reduce trading costs by implementing across the household. Additionally, we seek to build around external assets such as 401K accounts, so that the client has a holistic portfolio. We understand that the cost of rebalancing often outweighs the benefit of doing so. Therefore, we utilize tolerance bands and minimum trade thresholds for each security. We monitor the cash levels in each account and either notify you, invest, or raise cash in accordance with the settings you defined in the investment policy statement. Unless told otherwise, we will place less tax-efficient assets, such as bonds, in tax-deferred retirement accounts and more tax-efficient assets, such as stocks, in taxable accounts. By leveraging these asset location preferences, we can potentially reduce an investor’s tax liability. Unlike the industry simple-average equity fund expense ratio of 1.37%, the simple-average expense ratio of the equity funds that Asset Dedication uses is .33%. In addition, we often use individual fixed income securities that don’t carry expense ratios. The expense ratios stated above do not include management fees. What started as a University of San Francisco research project to make personalized pensions available to the everyday investor, first turned into numerous white papers, then a book, and is now a strategy adopted by many of today’s leading practitioners and academic institutions. Want to gain a deeper understanding of how we think about financial planning and investing? We encourage you to watch the videos below.